3936 Emma's Fashion Design Studio is a Friends set released in 2012. It includes Emma, a workdesk, a book, a filing cabinet, and a drawing board. The set includes a desk for Emma to sit at with her computer. On the bottom of the leg pieces of the desk there is Part:3023 in black. Above each of those is three purple Part:3004's. Connecting the two legs is a flat 1x6 white brick with two smooth 1x6 gold bricks on top of that. Sitting on top of the desk is a laptop and a hamburger. The hamburger is made up with two SNOT bricks with four green Part:4073's making up the contents of the burger. In close distance of the desk is a stool. The stool is made up of two parts with a camera sitting on top of it. The bottom part is a purple Part:3941 and on top of that is a pink Part:4150. On top of the stool sits a black camera. Also included in the set is a filing cabinet. The filinc cabinet itself consists of eighteen pieces. The base os the cabinet consists of five pieces. The five pieces are one one Medium Azure 2x4 brick. Next to that is a Medium Azure 2x2 brick. The part that connects these two bricks is a a 1x6 plate and a 2x6 plate both white. On top of the 2x2 brick is smooth tiles with scraps of "cloth" on it. The design board consists of eight pieces. This is where Emma sketches out her ideas for clothihng. On the bottom are two 2x2 sloped bricks to hold it up. Connecting those is 2x4 medium azure brick with at each edge is a 1x1 tile that is white. Behind the tiles are two 1x4 flat bricks on top of eachother and then on top of those is a modified 1 x 4 x 1 1/3 medium azure brick with no studs on top. Finally in front is a 1 x 2 x 1 panel in between the two tiles where then you can put the actual design baord in. The actual design board is 4x6 studs with in the middle a drawing of a dress for Emma to make. The work table consists of 32 pieces. As like the desk the legs are the same but instead of two there is four. Connecting these is a flat 6x6 piece with four 1x6 tiles that are gold in the middle of the piece. On one side of the table there is a lamp that consists of three pieces and at the other end there is a coffee mug and a thing of flowers. On top of the tables is an mp3 player and a ruler. On the front is a picture of the set where Emma is in a room where her design studio is all set up. On the bottom left corner is a picture of Emma. 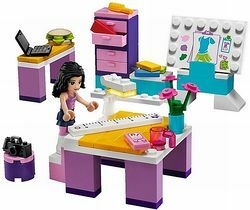 On the back is a picture of scenes that can be done with the set with on the bottom other LEGO Friends sets with the other Friends. This is a description taken from LEGO.com. Please do not modify it. (visit this item's product page) Create cool clothes in Emma’s Fashion Design Studio! The design studio is where Emma creates new clothes for her friends. She listens to music and also works on her laptop while having lunch in the studio. Facts about "3936 Emma's Fashion Design Studio"